I don’t know what’s going on here, but I think it’s from Japan. The West has been awash in Japanese popular culture every since manga and anime began to take root with young people in the early 1990s. Within a decade, the import of Japanese media has gone from a tiny niche market to a full-blown pop culture phenomenon. Japanese comics are now available in translation at major bookstore chains, Hollywood is remaking Japanese films like mad (such as Shall We Dance, remade in 2004 based on the 1996 Japanese movie), and some networks are devoting their prime time slots to animation from the Far East. The appeal of Japanese media has taken root in Western culture and has turned into a thriving import industry. However, Western audiences often experience long-distance culture shock when faced with media created by the Japanese for the Japanese. Despite efforts to tailor Japanese works for the American market, we are often confronted with cultural signals that are uniquely Japanese and have no direct equivalent Western culture. This has lead to a lot of head-scratching on this side of the Pacific, and has given rise to the internet stereotype that the Japanese must be insane. This incomprehensibility has kept some forms of Japanese pop culture from gaining traction with with mainstream Western audiences. An exception is Japanese horror, which has done particularly well in the West. Movies like The Ring (1998) and Juon (2003) have struck a chord with Western audiences, and have sparked a renewed interest in foreign movies and horror in general. Japanese literature like Haruki Murakami’s The Wind-Up Bird Chronicle is starting to gain a solid readership in the West (though still only a very select group of authors are available in translation), and horrific video games of Japanese origin such as Silent Hill, Fatal Frame, and Resident Evil are consistently popular. It seems that Japanese horror has successfully avoided the mire of culture clash and has made a significant impact on mainstream Western society. So what is it about Japanese horror that we find so attractive? What has kept it comprehensible and accessible to mainstream Western audiences? What is with all the freaky women wearing white with their hair covering their face? In this article, I will attempt to explain how Japanese horror works within the context of Japanese culture and how this approach is differs from the type of horror that Americans are used to. Before we get into how Japanese horror works and why we find it so affecting, I need to define a couple of example tales that I will refer to over and over again in this article. I have selected these stories because I think that they represent a fairly wide spectrum of Japanese horror, not because they are particularly unique to Japan; though I will eventually compare and contrast Western and Japanese horror, this initial treatment is designed to give you some idea of what the cultural landscape of Japan is like when it comes to scary stories. Please note that I am trying to present a general overview of Japanese horror, and consequently this article is full of generalizations; not all horror media from Japan will fit the characteristics that I describe, nor should you consider this article the definitive work on Japanese horror. The stories I have selected are as follows: The Ring (1998 film version), Toire No Hanako, Banchou Sarayashiki, and Yuki-Onna. Note that the next few paragraphs contain major spoilers, especially for The Ring. If you haven’t seen The Ring yet, do yourself a favor and go watch it right now. If you are familiar with these stories, you can skip this part and jump right to the next section. The Ring (リング) is a 1998 film that was directed by Hideo Nakata and based on a novel by Koji Suzuki. The film was released in America under the terrible name Ringu because some marketing executive decided that the remake-starring-white-people took precedence over the Ring name. In The Ring (I am always referring to the original version, not the remake), a news reporter named Asakawa (played by Nanako Matsushima) stumbles upon the story of a cursed video tape while collecting information for an article on urban legends. According to the rumor, a video tape exists that will kill the viewer seven days after it is watched. The only escape from the curse is to make a copy of the tape and show it to someone else, who must then copy it and show it again to save themselves. Asakawa tracks the tape down and watches it only to realize that the curse is real and that she has seven days to live. She spends the rest of the film searching for the force behind the tape, a psychic girl named Sadako who was killed by her father and dumped in a well years ago. As we see at the end of the film, Sadako climbs out of her well and through the TV of her next victim, manifesting her wrath in the physical realm from beyond the grave. Toire No Hanakosan (トイレの花子さん, “Hanako-in-the-Toilet”) is another contemporary macabre tale. The story behind Hanako-in-the-Toilet is this: if you knock three times on a particular stall in a particular school’s girl’s bathroom while calling Hanako’s name, you will hear her reply from within the empty stall. This story appeared in the early 1980s and enjoyed wide popularity among school children, spawning numerous books and a few films. Different versions of the tale describe various reasons that Hanako’s ghost sticks around (in some versions she was murdered in the bathroom; in others, she was a girl who committed suicide in one of the stalls), and her response differs widely as well. But the main crux of the Hanako-in-the-Toilet tale is the bathroom stall mechanic: by knocking on a particular stall and calling Hanako in a particular way, you can get her to answer you. Banchou Sarayashiki (番町皿屋敷, “The Story of Okiku”) is a classic Japanese ghost story about a maid named Okiku who is falsely accused of breaking a ceramic plate. The dish is part of a collection of ten plates, and is extremely valuable to her employers, a samurai family. Enraged by her mistake, the samurai kills Okiku and throws her in an old well. 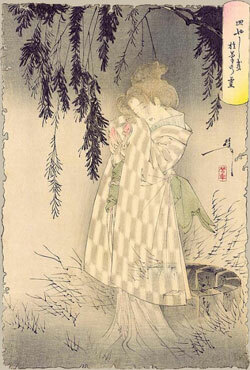 Every night thereafter, Okiku’s ghost rises from the well, counts to nine, and then breaks into sobs. Eventually her presence is so maddening that the samurai goes insane. Yuki-Onna (雪女, “The Snow Woman”) is another Japanese classic. In this story, a young man and his mentor are caught in a terrible blizzard while collecting firewood in a forest. They take refuge in a small hut and decide to stay there for the night. In the middle of the night, the young man wakes up to find a strange woman dressed entirely in white standing over the older man, blowing her breath upon him. The woman turns to the young man and tells him that she had intended to kill him along with his mentor, but because he is such a hansom lad she has decided to let him live. However, she tells him never to speak of this event to anybody, or she will kill him. The man is saved the following morning but tells nobody about his encounter with the snow woman. The following year, the man meets and marries a beautiful girl. They live happily and have several children. Then one evening the man relates his encounter with the snow woman to his wife. In a rage, his wife reveals that she is in-fact the snow woman he met, and were it not for their children she would kill him on the spot. With that, she melts away into the wind. It would not be difficult to write an entire book about the cultural origins of Japanese ghosts, but for the purposes of this article I will try to keep this section short. The two main religions of Japan are Buddhism and Shinto. Buddhism was brought by Korean scholars to Japan from China around 500 AD, but Shinto is indigenous to the country. Interestingly, most Japanese people today practice both Shinto and Buddhism depending on the circumstance; for example, weddings are often Shinto, while funerals are typically Buddhist. Neither religion requires strict membership, and for most people, religious rituals are performed because they are traditional, not because they imply some strong religious alignment. Thanks to this religious flexibility, Japanese culture has a wealth of legends and beliefs to draw upon from two different religions. Buddhism teaches that life is a facade and that the never-ending cycle of death and rebirth can only be avoided by convincing oneself of this deception. 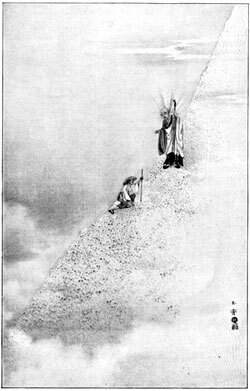 Many Buddhist ghost stories are designed to reinforce that idea (see Lafcadio Hearn’s translation of Fragment, in which a Buddhist monk climbs a mountain only to find that it is comprised entirely of the bones of his former lives). Shinto, on the other hand, teaches that any dead person can be prayed to, and otherwise has very little to say about life after death. The Shinto creation myth describes Yomi (黄泉), the land of the dead, but with the introduction of Buddhism Yomi was adapted to fit the Buddhist concept of multiple hells. In practice, Shinto teachings rarely deal with death directly, and only suggest that each person has a soul (called a reikon; 霊魂) that can become stuck among the living if the person dies while feeling burdened with excess emotion or is not given a proper funeral. This concept of “excess emotion” is something we will come back to, as it provides the underpinnings for most contemporary Japanese horror. The most important point here is that the Japanese typically do not align themselves rigidly to either Buddhism or Shinto, and the reconciliation of these two religions requires the society to accept that most of the universe is fundamentally beyond human understanding. Thus there is a level of ambiguity among beliefs that gives horror a strong basis to operate upon. But I am getting ahead of myself; before we can compare Japanese horror with Western horror, we need to know a little bit more about what we are dealing with. Rest assured that we will return to these points in a bit. 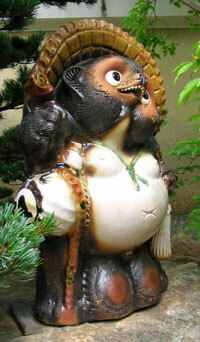 Otherworldly Japanese creatures can be broken down into two categories: youkai (妖怪) and yuurei (幽霊). A tanuki. Yes, those are his testicles. Youkai are weird beings that are as often bizarre as they are scary. Typically physical (as opposed to the more ethereal yuurei), youkai are similar to Western monsters: they are animal-like and often dim-witted, and though they may be malicious they seldom maintain any long-term goals or plan. This class of monsters includes goblins and ogres and the like, as well as neutral or benevolent creatures such as the tanuki (a shape-shifting prankster that looks like a large raccoon) and tsuchinoko (a snake-like creature that is wide around the center and can jump long distances). There are a great many types of youkai, and they pop up all over the place in Japanese cartoons and comics. However, these creatures are generally not very scary, and they have yet to make much of an impact in the West outside of video games (e.g. Mario’s raccoon suit is in fact a tanuki suit) and comics, where they are seldom depicted as fearsome creatures. Yuurei, on the other hand, are the heart of Japanese horror. Yuurei are ghosts or spirits that have been stranded on this world because they have some unfinished business or because they died while in the throes of intense emotion. Unlike youkai, yuurei have a singular purpose or mission, and they are very often malicious. A person who becomes a ghost is said to forget everything else about their life and focus only on that which is preventing them from resting. There are scores of stories (like The Story of Okiku) that depict ghosts who come back to haunt their murderers, or to express the anguish that lead to their suicide, or to reward those who fulfill their dying wish. The underlying concept behind Japanese yuurei is onnen (怨念), the idea that some emotions are so strong that their power can extend from beyond the grave. Almost all classic and contemporary ghost stories from Japan operate on onnen: in addition to the obvious case of Okiku, witness Sadako’s character in The Ring, the antagonist in Juon, or even the explanations given for Hanako’s origin in the Hanako-in-the-Toilet story. Onnen is the central concept behind yuurei, and as we will see, it differentiates Japanese horror from works in the West pretty dramatically. The Japanese often portray yuurei as people dressed in white funeral garb with long dark hair. Originally, yuurei were portrayed in art and theater as indistinguishable from regular people, but in the 18th century the style changed: since then, the legs of ghosts seem to fade into thin air, and they are often shown to have their arms outstretched and hands limp. For some reason, yuurei seem to very frequently female. Perhaps this is because women are thought to hold grudges longer and more powerfully than men. Japanese yuurei tend to haunt a specific person or place. Since yuurei have an explicit reason for sticking around in the mortal plane, they do not often waste their time attacking people who have no relationship to them. In The Story of Okiku, for example, Okiku’s despair over her false accusation is so great that she is unable to rest, even though she was not at fault. Though her appearance eventually causes her murderer to take his own life, her behavior as a ghost indicates that it was this mistake, not her murder, that brings her up the well every night. We can thus assume that the death of her killer does not put her to rest; she might instead be appeased if the plate were replaced, or if a set of ten plates were placed by her well, thus correcting a problem for which she has been blamed. This example also reveals another interesting mechanic used in many Japanese ghost stories: the idea that the troubles of spirits can be solved using an effigy or proxy. In Of a Mirror and a Bell (see ), a woman kills herself after being publicly humiliated during the construction of a brass bell. In her suicide note, she declares that any person who is able to break the bell by ringing it will be generously rewarded. When the bell is lost, an enterprising farmer is able to conjure up the ghost of the deceased woman by destroying a model of the bell made of mud. This mechanic reenforces the idea that Japanese spirits have a singular purpose in the human world, and that they need not always be malicious to achieve their goals. Sarayashiki Okiku No Rei (“Okiku’s Ghost at the Dish Mansion”), 1890 by Tsukioka Yoshitoshi. Notice that her lower body is transparent. The universe is governed by rules. This is a central theme in Japanese horror; we can almost always see some sort of logical progression based on some implied set of rules that govern the way all things work. We have already talked about onnen and some of the rules associated with death, but this characteristic implies that there are rules for everything. This often manifests as a sequence of events that must occur before terror can be revealed, such as the Hanako-in-the-Toilet summoning procedure. The rules of the universe are beyond human understanding. An equally central theme is that the rules and the reasoning behind them may not be something that people can grasp, and thus one must accept that which he cannot explain. Why does Hanako require a certain stall of a certain bathroom at a certain school to be knocked upon a certain number of times? The answer can never be clear, but that does not stop the audience from believing the story. Another example is the Yuki-Onna story, which suggests that the snow woman has no choice but to reveal herself after her husband betrays his secret; it is as if the promise between them is all that binds her to the mortal plane. Modern society offers no protection from spirits and ghosts. Contemporary Japanese horror very often involves ghosts hijacking modern technology, even though the motives of most malicious spirits are not significantly different than they were a few hundred years ago. Perhaps this reflects some anxiety about the amazing speed with which Japan reinvented itself and rose to economic power after World War II. We can see this influence clearly in The Ring (the video tape as a curse), Juon (the characters are constantly confronted by appliances that are no longer trustworthy), and films like Tetsuo The Iron Man, where metal itself plagues the protagonist like a disease. Perseverance in the face of utter destruction. It is impossible to talk about modern Japanese culture without acknowledging the impact that the atomic bombs had on the Japanese psyche. A world that has been utterly destroyed and yet must still sustain life is a constantly recurring theme in modern Japanese media: it is a direct theme in works like Godzilla, Akira, and Dragon Head, and it manifests on a much more subtle level in all sorts of other aspects of the culture (consider, for example, Princess Mononoke’s finale). Damp Settings. While Western tales of the macabre tend to take place in dry, musty locations such as mansions, basements, or cemeteries, the Japanese tend to associate spirits with water and humidity. Perhaps this is because the Japanese summer months are characterized by intense humidity that persists even after nightfall. The art and culture magazine Kateigaho pointed this characteristic out in an interview with Koji Suzuki, the author of The Ring novel series. Dank, confined spaces, [Suzuki] believes, are the most conducive to the appearance of ghostly spirits. … It is damp settings rather than dry ones that the Japanese associate with spirits. In Western horror movies, the bathroom is a frequent backdrop to terror. J-horror too makes audiences recoil by suggesting that a disembodied spirit is about to creep into a damp space, a space so damp it’s hard to breathe. Kateigaho also notes the association of water in some of Suzuki’s works, including Honogurai Mizu no Soko Kara (Dark Water, 2002) and The Ring. Throughout the remainder of this article I will return to several of these characteristics. A few of them lie slightly outside the scope of this document, but I have included them because I think that they are relevant avenues of study to anybody interested in Japanese horror. Now that we have covered the cultural and historical background for scary Japanese stories, let us take a look at modern Japanese horror within this historical context. With the exception of the above-mentioned influence of technology and the effects of the atomic bombs, Japanese ideas about ghosts and fear have not changed dramatically in the modern era. The introduction of mass communication has certainly brought a great deal of Western influence to the Japanese, but the underpinnings of Japanese horror (such as the concept of onnen) run deep in the culture. A good case study of classic Japanese horror concepts in a modern package is The Ring. Though there is a wide selection of Japanese horror movies produced before and after The Ring, this film remains significant because it its intense popularity in Japan and abroad. If we closely examine The Ring, we can see that it is in many ways a classic Japanese ghost story retold in modern context. 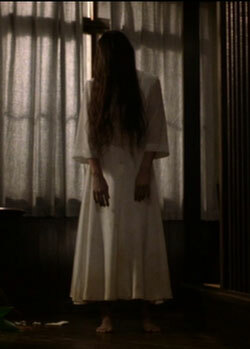 Sadako, the films antagonist, almost perfectly fits the description of classic Japanese ghosts: she wears white, her hair is long and hangs over her face, and she exerts her power in the mortal plane because she died a horrible death. Though Sadako has feet, she’s otherwise very similar to both Okiku and Yuki-Onna. Like Okiku, her remains rest at the bottom of a well, and she must ascend out of the well before she can pursue her revenge. Like Yuki-Onna, Sadako is malicious and destructive, but she is still bound to the rules of the universe. If her victims do not watch her tape, or if they follow the correct procedure to free themselves from the curse, Sadako can have no power over them. The protagonists in The Ring spend most of the movie trying to locate Sadako’s body and put her to rest, but as we see at the end of the film, their efforts are trumped by the rules of the curse. Though the film’s core mechanic requires modern technology (the video tape) to operate, The Ring is very much a classic Japanese ghost story. Sticking with this theme of traditional Japanese horror in a modern format, let us take a closer look at the Hanako-in-the-Toilet story. On the surface, we can see that it also bears some similarities to The Story of Okiku: the toilet is not all that far removed from an old well, as both are places associated with water, darkness, and filth. This story also adheres to the rules-of-the-universe characteristic, as an exact procedure is required to get Hanako to appear. But what I think is much more interesting about this story is the accessibility of it, especially to school children. As Hiroshi points out on his extremely informative site Gendai Kaidan (現代奇談, “Modern Day Ghost Stories”), the Hanako-in-the-Toilet story is almost perfectly designed to allow school children to test their mettle. The elements required to reproduce the procedure described in the story (i.e. a school with a girls bathroom) are universally accessible, and the consequences of the story are non-threatening (in the original version, correctly calling out to Hanako is supposed to only cause her to verbally respond–there was no implied danger). Hiroshi suggests that the popularity of this story throughout the 1980s was fueled by its simple and easily-reproducible premise, as well as by persistent rumors of classmates who had performed the procedure and actually heard Hanako respond. The TV is not your friend in Juon. Both The Ring and the Hanako-in-the-Toilet story tap into the idea that technology and modern society in general provides no protection from spirits. In fact, The Ring and Juon both go a step further and suggest that technology may be exploited by malicious entities to wreak havoc on their victims. This theme is extremely common in modern Japanese horror. One interesting example is the rumor that was popular in the early 1990s during the pager boom. According to rumor, it was possible to get a page from a phone number that could not possibly exist. Even worse, this number (564219) sounds like the words “I am coming to kill you” when read phonetically (ごろくしにいく, “go roku shi ni i ku,” is transformed into 殺しに行く, “koroshi ni iku“). Another very recent example of this theme is the Flash animation Red Room. Red Room tells the story of mysterious internet popup ad that is rumored to exist. If you surf the web long enough, the rumor explains, eventually you will get a strange popup ad with a nonsensical message accompanied by a weird voice. The rumor holds that if this popup ad is ever closed, you will die. Red Room is a nice example because it embodies so many classic Japanese horror characteristics: in addition to the use of technology by some sort of malicious, otherworldly force, the rules governing the popup ad are both ironclad and difficult to rationalize. Modern Japanese horror is clearly influenced by the events of the 20th century (especially the second World War, the rise of technology in every day life, and the influence of mass communication), but at its core it remains faithful to the characteristics that have defined Japanese macabre for several hundred years. Now that we’ve covered the elements and history of Japanese horror, let us take a look at how the West compares. Europe has a rich history of stories about ghosts and other monsters, and America has happily inherited much of that culture. In his book Danse Macabre, Stephen King identifies three archetypical stories that he believes have shaped modern American horror: Frankenstein, Dracula, and Dr. Jekyll and Mr. Hyde. Indeed, the themes in these stories have become so ingrained in American culture that horror (especially horror cinema) has become defined by these clichés. Some American horror clichés have become so accepted that we actually have special terms to describe them, such as final girl. It is perhaps our complacency with these themes that makes horror from other countries interesting; after all, horror cannot be very effective if the viewer has a comfortable idea of the outcome from the get-go. So let us take a look at how contemporary Japanese horror differs dramatically from American contemporary horror. As an American, I have often been struck by the unconventional presentation of Japanese horror films and games. Over the last thirty years American horror film has become increasingly action-oriented; we are often treated to shoot outs, fights, and scenes of monsters mauling victims. Japanese film, on the other hand, has remained mostly understated, relying primarily on mood and pacing rather than blood and guts to achieve scares. Horror author Koji Suzuki points out that unlike most American horror cinema, many Japanese stories do not end in the destruction of the antagonist. To me, blood-and-gore horror movies are for kids … Kids are taken in by that sort of stuff. But real fear, the genuine article, has to stimulate the adult imagination. In America and Europe most horror movies tell the story of the extermination of evil spirits. Japanese horror movies end with a suggestion that the spirit still remains at large. That’s because the Japanese don’t regard spirits only as enemies, but as beings that co-exist with this world of ours. This understated tone actually helps Japanese horror be more effective, as even the results of the protagonists’ struggle are often ultimately in vain (as in The Ring). Another common aspect of American horror is our burning need to explain away and rationalize the supernatural events that occur in the story. For example, the original script for Alfred Hitchcock’s Psycho did not include the final scene where Norman Bates’ psychosis is hastily explained by a psychologist. The scene was added to quell fears held by the producers that audiences would not understand the film’s finale. Similarly, the American remake of Juon (called The Grudge, released in 2004) added several scenes to explain away the antagonist’s motivations and the way the universe works. Unlike the original Japanese version, very little was left up to the imagination. The American remake of The Ring sported similar features: entire sections about Samara’s (Sadako’s post-localization name) life were added to help explain various details of the plot. Almost all American horror films take pains to explain why events in the plot occur (though there are exceptions; see The Shining and The Birds). This comfortability with leaving some things unexplained may relate to Japan’s religious flexibility. As previously mentioned, reconciling both Buddhism and Shinto within the culture requires the Japanese to accept a level of ambiguity about how the universe works. This is almost diametrically opposed to the classic Christian perspective, which tends to break the world down into “good” and “evil” categories. The idea that the rules of the universe are beyond the scope of human understanding also allows horror authors more leeway in creating their stories because their target audience has less of an expectation that all will be made clear with time. This characteristic in turn often leads to more powerful horror stories, as much is left up to the viewer’s imagination. There may also be another, secondary trait here; while American horror is often concerned with a decent into the unknown (Jonathan Harker’s trek to Dracula’s castle, the group of teenagers entering the haunted house cliché, the Bates Motel in Psycho, et cetera), Japanese tales often describe the unknown invading the known. Sadako comes out of the TV and directly into the homes of her victims, Hanako’s toilet is not a noteworthy location, and the samurai in The Story of Okiku cannot escape the ghost of Okiku because she refuses to stay in her well. This probably relates back to Suzuki’s conclusion that the Japanese accept a degree of otherworldliness all around them, while Americans like to concentrate our evil spirits in a specific location (witness our oft-employed “Ancient Indian Burial Ground” cliché). The American approach may be another side effect of Christianity’s tendency to separate everything into absolutes (in this case, defining explicit physical boundaries between “evil locations” and “normal locations”), but it also means our horror is often less effective; once a character or location is known to be “good” or “evil,” there is a certain degree of expectation we can rely upon to remove tension from the drama. The more vague and invasive approach often employed in Japanese horror can thus be far more affecting, as we do not have any comfortable story archetype to cling to. Though we may sometimes be confused by the nuances of media from Japan, the country is home to a wealth of history, tradition, and culture. Japanese horror has piqued the interest of Western audiences with its understated tone and lack of easy answers, but outside of its cultural context even horror can be confounding. In this article I have attempted to explain some of the common mechanics of Japanese horror, as well as the belief systems, history, and modern context within which these mechanics exist. Though I have only scratched the surface of the culture of this complex and interesting country, I hope that this article has given you some insight into how Japanese horror works. The study of culture, even through pulp media such as horror film and games, is an intensely interesting and rewarding activity; I urge anybody interested in horror to spend some quality time with some of the amazing works from Japan. There is much more relevant information that could be covered here, but I will leave future investigation up to you. So curl up with your favorite horror movie, game, or book, and pay close attention; beyond the screams and the blood there is a whole culture hiding. 1 Lafcadio Hearn. (1971). Fragment. In: In Ghostly Japan. Tokyo: Tuttle Publishing. p3-7. 3 Which is itself pretty interesting. See this Wikipedia article. 4 I am borrowing heavily from Tim Screech’s (what an appropriate name, huh?) excellent article entitled Japanese Ghosts. It was first published in the magazine Mangajin (issue 40), but is now also available online. It is very well written and covers a lot more info than I have here. 7 Again, Tim Screech’s article has a lot more info than I am including here. See the “ATTRIBUTES OF YUREI” section of his article. 9 Gendai Kaidan Note that this site is entirely in Japanese. You can watch Red Room, but it isn’t very interesting if you cannot understand Japanese. 11 Stephen King (1981). Danse Macabre. New York: Everest House. p49. King has a lot more to say about horror in America that I am totally omitting here. You should read his book. Thanks for the very informative article, Chris. Excellent work like this is why your blog is my favorite. Mind if I steal this for my dissertation?….Too late. Just joking! Quite well written. Almost like an academic piece, except a lot lot more interesting. The story of the Snow Woman reminds me of the time me and the wife saw the film Kaidan. We are lucky enough to live close to a small cinema called the Metro run as part of a university film school. It’s a sort of art house cinema that runs good movies rather than just the latest Hollywood blockbusters. Kaidan is a film of four Japanese ghost stories but some of the print was spoiled so before it started they got in a Japanese actress who stood at the front in full cultural dress and makeup reading the missing segment (the Snow Woman) by candle light. We both agreed that this was the highlight of the evening. The rest of the film was good and it was fascinating to compare the very slow, (and I mean really slow) pacing compared to western, MTV style editing. Great site by the way. Robot Carnival ( part of the marathon/festival ) , Ako vs. Grey side or whatever , ect. Supposedly even Rainbow Brite was actually an Anime not an American product. Hi! i’m from Chile and i’d like to say first of all the page is great! so congratulations to Chris, and well, i love survival horror games and japanese horror movies so now that i found a “forum” in this page about japanese horror movies andthe best for me are JU-ON, RINGU and ONE MISSED CALL and i’d like to add a korean one like “SHUTTER” you have to see these tittles take care all, bye! good work on the peice here. you know i read somewhere another trate of the dead or spirits popular in asia is the eyes being portrayed as being wide open (much like westerenrs….) i forget exactly why it is, but you can see it in alot of art and in quite a few movies. the two examples i can give at the moment would be the grudge ( i haven’t seen the original juon) and David Lo Pan from big trouble in little china. i realize these are americanized movies, but i have seen the refrence more than once from japanese stories and depictions. just thought i’d point it out. again, good work. Just out of curiousity have you ever seen the movie the Changeling? It came out in the late 70’s and had George C. Scott in it. I think this movie is a good in between the two cultures movie because it incorporates horror aspects from both cultures. Water and revenge are extremely important along with the more north american detective thing where we have to figure out what’s going on. This is clever stuff; I have been enjoying the local horror movies before I even moved to Japan, and your clear explanations of your research has given me further insight into why it is so effective. Ive allways thought it was weird that the main haunter in the J-horror was a girl and that there movies were so freekin weird,but this clears a few questions that ive had for a while. One thing I’ve noticed in a lot of contemporary horror films is all the flickering. The ghosts and spectres have this static-like jerking quality. Do you think this corrolates with the theme of spooky technology in Japanese films? Yuki-Onna(The Snow Woman)reminds me of this epsisode from tales From The Darkside The Movie: about The Gargoyle statue on top of a church that was in love with an artist. (The artist could see the statue everyday from his upstairs studio apt.) But in this twist the statue comes to life one night in order to save him from being killed by muggers. The Gargoyle spares him, then makes a pack with the artist to never speak of this night to no one in trade of his his life. Later that night he runs into a beautyful woman (Rae Dong Chong the daughter of Tommy Chong of Chi&Chong)who he starts a life with, marries and has two children (boy& girl). Oh yeah he(notice that the statue was no longer there on the church.) also sketches drawings of the Gargoyle, hides them to later shows them to his wife years later who is infact the Gargoyle statue which does’nt hasatate to kill the artist. (Bites a big chunk out of his neck). The children also change into Gargoyles as well??? So The monster Takes her young (bust a big hole through the upstairs studio apt. )and all three fly back to the top of the church to become statues once more. The End……. I’m only half way through this article but I have to say it now: very interesting read, especially the comparisons between Japanese and American horror. I don’t normally enjoy being informed but this is an exception. Bookmarked, I will return to this page later. And if i die, my spirit shall return. I really enjoyed the differences pointed out between American and Japanese culture in regards to the way horror stories are written. You mention an interesting analysis that yuurei are usually female. I also wonder why they are mostly females. I do not totally agree that women hold more grudges than men as you have stated: “Perhaps this is because women are thought to hold grudges longer and more powerfully than men.” This saying is just a stereotype, it is not neccesary the fact. I think that since history, women were mostly the victims of men through many forms such as oppression, objectification etc. Therefore, female yuurei’s agony were so poignant that they are “in the throes of intense emotion.” They were victims that come to seek revenge. I think you misunderstood what I wrote. I said that women are “thought to hold grudges longer than men” because this is what some people think. It is indeed a stereotype, but one held by enough people in Japan that it has had an influence on Japanese ghost stories. This isn’t a fact–of course, you can never generalize all women or all men into some sort of stark category like this–but it is a belief held by some people that has manifested as female characters in ghost stories over the last 200 years or so. Also, it’s important to note that while there are plenty of stories about revenge, Japanese ghost stories often rely on “throes of intense emotion” that have nothing to do with violence. For example, in Lafcadio Hearn’s book, there’s a story called “The Dead Secret” about a ghost who returns after death because she is worried that her family will find a love letter from her youth. In this case the fear of her family finding out about her long-over secret romance is the “intense emotion” that holds her spirit in this world. “Of a Mirror and a Bell,” another story I mentioned in this article, is similar: in this case, the woman who returns kills herself in shame, and though her “intense emotion” is anger, she’s not out for revenge on any particular person. Links to these stories are in the bibliography, above. Nice article. I was searching for articles on how to explain and describe Japanese horror in terms of tone, space, lighting, and other aesthetic conditions, but your article was a good read in educating me on the premises behind the film. Great, excellent review of japanese horror! I’m partly doing the same research. I go more deeper to answer questions like why the onryou is female (there is psychological logical explanation I assume) and why the genre was resurrected after so long time. Chris I’ve been visiting your site since about 2002. I think you are fantastic and you have the most interesting things on here ALL THE TIME! I’m a 26 yr old mother of 3 and I don’t get much time to myself, but when I do have time I am playing survival horror games or watching scary movies and this is the GREATEST place to find out the latest. THANK YOU!! and keep up the good work! Thanks for your opinion, Chris. In general – I prefer J-Horror, not the Western. This is the prime reason why Silent Hill is my favorite game/movie, althou, it combines both ways of horror. I find eastern horror to be much more intelligent and puzzle-like. That’s why I love J-Horror. Thanks for expanding my understanding of J-Horror by providing information. I like very much your parallel between Western and Eastern horror. I myself wrote a book depicting various yôkai, yûrei and so on. I just presented them in their original background, and didn’t dare to draw any parallel with Western counterparts, or compare them with modern version. This reminds me of something I recently deduced. For the longest time I reasoned having crows in Resident Evil was just to capture a more generic fear of birds. Along the lines of Hitchcock’s The Birds. But recently I read an article about what a terror crows are in Japan. How they disrupt power lines with their nest, cause black outs, and have even been known to attack small children. So what I assumed to be a generic horror was one that was specific to their culture. Anyways, I really liked this article. It was great to get the names of a few of those classic Japanese horror stories again. Especially that toilet one, I’ve alway heard references to it but never heard the original. I thought this page was interesting. Some of the perspectives offered within, I had not noticed before. I enjoyed this page it was fun. I’m from Sweden, and I’ve recently been introduced to the whole Asian horror scene; not by any Western remakes (like, I suspect, are the first things people watch), but by the game Silent Hill 2 and the movie series Three Extremes. After that, I’ve watched every mainstream Asian horror movie I could get my hands on (like The Ring, Juon, Oldboy, Gin gwai (The Eye), Audition, Chakushin ari (One missed call), Imprint… you get the picture) and I really wondered what the big deal about pale girls with long black hair covering their faces was. Now, after reading your article, I’ve really come to an understanding about the Japanese mystery/mythology and what impact it has on their movies. Thank you so much for a very interesting article! Unfortunately, youkaimura the site has been taken down or supposedly is somewhere out there in archived .zip form but I never could find the zip…anyway you can find a “new” board for youkaimura if you google it and no “obakemono” is not a better site…it’s an insult to the creator of youkaimura, the site itself, and all its fans/users to say that obakemono is better. Let people decide for themselves what site is better. In my opinion youkaimura is better, for various reasons…but it is best to let people decide for themselves. I hope this gets published despite lack of of discussion over Japanese horror. Your article says that youkai are “often dim-witted” and “seldom maintain any long-term goals or plan;” this is not entirely true. Quite a few types of Youkai are as clever as humans, sometimes more intelligent. And they can perform complex and strategic thinking. A good example is the kitsune the fox youkai, or the fox spirit. Most kitsune are clever and often uses their shape-shifting ability to change into beautiful woman, in order to seduce, trick, and manipulate men. High level kitsune can do more than shape-shifting; a really old (and by “old,” I mean a thousand years old) kitsune is very, very powerful. 天狐/てんこ, or the heaven-kitsune (I simply translate the kenji into English, as I know very little Japanese) has千里眼/thousand-li-eyes (capable of seeing things are very far away from it, or omniscient ), and a god-beast. 空狐/くうこ, or the sora/sky-kitsune also has the status, or the power of a god. 白狐（びゃっこ、はくこ）, or the white-kitsune is regarded by the Japanese as the good kitsune and is worshipped in some temples. According to legend, the famous court onmyōji, sorcerer, astrologist, exorcist, and a playable character in the PS2 game “Kuon,” Abe no Seimei’s (安倍晴明) mother was a white-kitsune. The most famous type of kitsune got to be九尾の狐（きゅうびのきつね）, the kumiho, or the nine-tail kitsune. This is because a certain sub-species of kumiho, 白面金毛九尾の狐（はくめんこんもうきゅうびのきつね）, the white face-golden-fur-kumiho (I think it is the only one of its kind) was believed to have cause a lot of trouble in the royal court of many Asian countries. In ancient Japan, this kumiho disguised as an ultra beautiful and super intelligent courtesan named Tamamo-no-Mae, to seduce the Japanese Emperor Konoe, in an attempt to take over the throne or cause disorder within the court then later the entire country. In ancient China, it was believed that the kumiho firstly killed a beautiful woman named Daji who was about to send to the royal court, then disguised as the woman. Later, after winning the love of the emperor, it proceeded to cause the downfall of the dynasty. In ancient India, it disguised as the concubine of the prince and caused the downfall a certain Indian kingdom (couldn’t find the English translation for the kingdom). Another example of intelligent Youkai is tengu. Tengu are ghosts of excessively arrogant men, women, Buddhist priests and nuns. They are not considered as spirit, as they can go neither to Heaven nor to Hell; their arrogance prevent them from going to Heaven and their belief in Buddhism stop them from falling into Hell. Some of tengu are very smart, as they were once knowledgeable men. These are called daitengu, or great tengu (大天狗). Ghosts of arrogant yet ignorant men and women would turn into kotengu, or small tengu (小天狗). ultra beautiful and super intelligent courtesan named Tamamo-no-Mae, to seduce the Japanese Emperor Konoe, in an attempt to take over the throne or cause disorder within the court then later the entire country. In ancient China, it was believed that the kumiho firstly killed a beautiful woman named Daji who was about to send to the royal court, then disguised as the woman. Later, after winning the love of the emperor, it proceeded to cause the downfall of the dynasty. In ancient India, it disguised as the concubine of the prince and caused the downfall a certain Indian kingdom (couldn’t find the English translation for the kingdom). The toilet story reminds me of a story I heard growing up. You were supposed to enter a bathroom with a mirror. close the door and turn off the lights. You had to be alone in the dark. While facing the mirror, say “Bloody Mary” three times, and the face of Bloody mary would appear in the mirror, glowing red. This story seemed to imply though that it didn’t have to be Bloody Mary, that any dead individual would do. One popular substitute was to call for Elvis instead. This article perfectly sums up how I try to explain my obsession with “J-Horror.” While I enjoy the cheesy horror flicks that is churned out (Mystery Science Theater 3000 fan) I am really a snob with “good” horror. I particularly liked your reference to how the Japanese have the “unknown invade the known.” I think this feature has worked with some American horror. Take for example the first Halloween movie. Michael Myers, while a known killer, was placed in a normal setting of an everyday suburb. The first scenes when he was standing by the bush in broad daylight silently look on was immensely effective I feel. There was no scary sounds or dark cob-webbed filled hallways. Just a maniacal killer, in full killer garb in broad daylight. Anyway, amazing article and I liked how you included the religious contrast with Japan and America as I feel it is strongly ingrained in the cultures. Great article! I loved it, and it certainly helps crystallise two different approaches to horror. I’m glad you mentioned “The Shining”, all the way through I was thinking; there’s an example of Western horror that has that almost Japanese trait of ambiguity and dreamlikeness about it. The discussion about rules was particularly good. I think, whether you choose to give little explanation or lots of explanation, all storytelling, even horror requires rules that can’t be broken. Sadako can’t kill anyone before seven days have elapsed, the serial killer can’t take completely unbelievable levels of damage (hence why the Halloween sequels almost turned into farce). I guess, if there’s a take-home message from this, it’s screw with your audience, sure, leave ambiguity, sure, but don’t insult them. You’ve got to be unpredictable, but without cheating. A really interesting article. 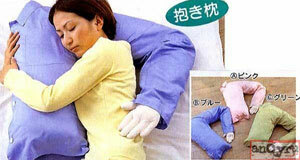 I love both the US and Japanese style of horror movies but the Japanese movies look far creepier to me. I hadn’t realised how deeply embedded into the culture those stories and images really are. I swear that when I was reading the paragraphs following “Modern Japanese Horror”, I saw the girl in the picture twitch. I guess Japanese horror still freaks me out to this day even after I’ve been desensitized to western horror. I find the taking the unknown into the known technique very effective; for example, upon watching the movie evil twins, I was surprised, unsettled and horrified that the ghost appeared in broad daylight, in many people’s homes…I j-horror, one implies that nowhere is safe, as even a crowded gathering can be affected. I also find the fact that I dont really understand, and so cannot predict an outcome to be really affective at scaring people…great article, thanks! I really like theme of the universe having a strange set of rules that are beyond human understanding. It’s why I enjoyed Silent Hill 2 so much. If any kind of media piece attempts to be horrifying, too much rationalization often kills it for me. My goal in this article (written in 2006–how can it be that old!?) was to contrast Japanese horror tropes with Western horror tropes. I assume that my readership has watched a lot of Western horror movies and is reading this because they are interested in the Japanese approach. No intent to slight Western horror films–there are a great many that I love to death–but this article wasn’t about them. Also, the last decade or two have been pretty bad for horror films coming out of Hollywood. There have been a few gems, but by and large the horror films that have come out of the US in the last 20 years seem (at least to me) to be primarily cash-ins. This is a generalization, of course, but I think the wave of Japanese horror film interest that hit in the early 2000s was a direct result of folks being bored with yet another I Know What You Did Last Summer clone. Films like The Ring seemed fresh and scary compared to the teenager-targeted lowbrow cliche-fests that Hollywood seemed to be releasing in an endless stream. It’s been a long time since we’ve had something like The Shining come out of the US; these films from Japan struck a chord with people who aren’t interested in recent Hollywood horror. With respect to the question about “good” or “evil” characters: I was suggesting that often (not always, but often) in Western drama we like to identify a character as 100% good or 100% evil and then expect them to act that part. The “bad guy,” once identified as such, will always do the “bad” thing given a choice. It’s actually a hallmark of poor writing, I think: these characters are paper thin. Still, we seem to have a whole lot of them in our Western horror pantheon. The problem with that, above and beyond being sort of terrible writing, is that once a character is identified as good or bad, we can relax a little. We know the hero will survive and the bad guy will get it in the end. It’s comfortable. And that’s exactly NOT what we should be feeling when watching a horror movie. It’s a failure on the part of the film makers (and not, just in case you were wondering, often repaired by a crazy twist ending). Following this trope removes a degree of fear from our minds, robs some of the tension from the drama, because we know what’s going to happen and don’t have to worry about it. Japanese film often keep us guessing. Partially because we are just unfamiliar with the Japanese tropes and cliches, so they don’t ruin the drama for us (though they might for Japanese people). And partially because their characters are often a lot more complicated and conflicted (e.g. antagonists almost always begin life as innocent people). Finally, I do think that one hallmark of all successful horror, Western or Japanese or Russian or Indian or anything, is allowing room for the imagination in the reader/viewer/player. The writer’s job is to communicate just enough that the reader can fill in the blanks with whatever terrifies him most. It’s not just about fear of the unknown, it’s about making the fear personal to each person by getting them to supply some of the details. That’s why horror is fascinating to study! When it’s good, it’s designed to be coy with the facts and forces us to think for ourselves. Lovecraft’s cosmic horror frequently share many elements with the cosmicism in Japanese horror. Because I was familiar with the world of Lovecraft’s world of ideas, I had no difficulty “getting” Japanese horror. The unknown exists alongside humanity? Check. The unknown invades the mundane world? Check. The universe has rules, but those rules are alien and incomprehensible? Check. I think the perception of “Western” horror being fundamentally different from Japanese horror has more to do with the influence of Hollywood than anything else. I didn’t personally find any vagueness with the statement. In western theories we are taught monsters come out at night. This is what I grew up with. So the different perspective is interesting. But in some of the Asian horror I’ve watched, the fact that the horror happened in broad daylight made it that much more disturbing. Thanks, this was an interesting read, and provided some good insight. After watching ju-on: The Grudge, I was curious about why it was so different from American horror. First of all – great article. I think you did a really great job by summirizing most important of what makes japanese horror. I think that japanese horror is always based on inevitable facing the death, confronting the victim with something that cannot be avoided. For the same reason why michael myers is scary. he just stands there, but he will gets you, count on that. There’s certainly something different about Japan horror vs western horror but I’m not sure you put your finger on it. For example: Halloween seems very much like Ring. Some guy, in white, killing innocent people (people unrelated to his death IIRC). Also IIRC he’s never caught. I suppose Friday the 13th … he never dies and while he’s killing camp counsellors as revenge he’s not killing the ones who let him die. (and of course in the original it was his mom). Clearly there’s something different because they feel very different. They’re often about different topics. Uzumaki for example. WTF? Some of the stereotypes of US horror seem less present in Japanese. The final girl for example and all the stuff around that. But otherwise I’m having a hard time not fitting many of the Japanese things mentioned on to US movies and seeing them as substantially similar.